Diego Fernandez de Cevallos Ramos was last seen at his ranch home in central Mexico. Family of a ex-Mexican presidential candidate ask for authorities to "remain in the margins"
Mexico City, Mexico (CNN) -- The family of a former Mexican presidential candidate and senator asked authorities Friday to stand back from the case to allow negotiations for his release. Diego Fernandez de Cevallos, 69, disappeared a week ago near his ranch in the state of Queretaro in central Mexico. Blood and other signs of a struggle were found inside, police said. In the letter, the ex-senator's son, Diego Fernandez de Cevallos Gutierrez, thanked the authorities for their "diligence and commitment" in the investigation, but asked that they "remain in the margins" of the negotiation process to guarantee the life and safety of Fernandez de Cevallos. The senator's family had issued a plea Monday asking the abductors to negotiate with them for his release. A photo showing a blindfolded man resembling Fernandez de Cevallos was e-mailed this week to the media but hasn't been authenticated. 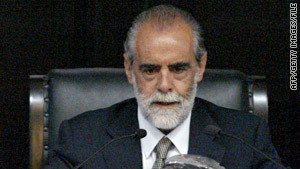 Fernandez de Cevallos was a presidential candidate in 1994 and has served in both houses of the Mexican congress. He belongs to the same PAN political party as President Felipe Calderon, leading some officials to speculate that he may have been abducted by narcotraffickers. More than 22,700 people have been killed since Calderon declared war on the drug cartels shortly after taking office in December 2006. Fernandez de Cevallos' conservative politics also have led others to speculate that leftist guerrillas may have abducted him. But the guerrilla Popular Revolutionary Army issued a statement Monday saying it did not have anything to do with the disappearance. CNN's Gustavo Valdes in Atlanta, Georgia, contributed to this report.